Say Happy Valentine's Day with non-fattening crochet chocolates! I absolutely ADORE chocolates. If my taste buds had their way all my meals would consist of an entree of chocolates, a main of chocolates and a dessert of chocolates. Followed up by a hot chocolate covered in whipped cream and chocolate sauce. So I made these little chocolates out of yarn instead! They are so easy to make and they look like yummy little chocolate truffles. Pop them in a chocolate box and you have a display that lasts all year round without adding chubbiness to your thighs! To make them you need to know basic crochet stitches - Chain stitch (ch) US single crochet (sc), and single crochet decrease (sc dec). This pattern is worked "in the round" which means there is no joining of rows. It is worked in a spiral and is also known as Amigurumi. Because of this you might find it easier if you use a "stitch marker". A safety pin, bobby pin, piece of contrasting yarn, etc. are all options to allow you to "mark" the last stitch of each row. Stuff when the opening is getting smaller. I stuffed when I had completed 4 decreases in the last row, and only had 2 to go. It can be a bit hard to get the stuffing in. Use the blunt end of the crochet hook to help you! Fasten off and leave a tail a few inches long. Use a yarn needle to sew the small opening shut and thread the tail back through the chocolate to hide the end. Now you get to decorate your truffle! I used cream coloured yarn to create a white chocolate "drizzle" on one truffle. I also used pearl beads on the other. You could use small fabric flowers, colourful beads, etc. to create the look you want! Go crazy - decorate a pretty box and put a whole lot of them in to keep as a special display. If you miss that yummy chocolate smell, get some chocolate essential oil and pop a few drops in. 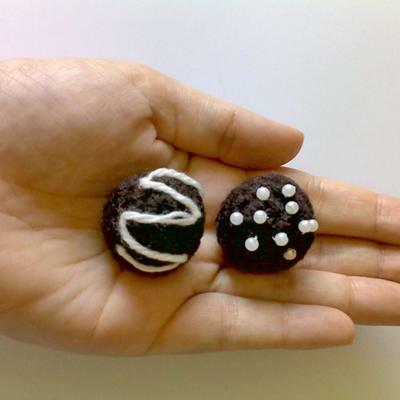 Kylie, thanks so much for this detailed pattern for making crochet chocolate truffles. Too cute!